Collect up to €50 in real cashback! There is more than just one reason to be jolly at Guts this Christmas, with Guts Xmas Missions throughout the festive month. Mission Four is here – and there’s no messing about. Wager a minimum of €50 on any of selected games until 13th December 2018 and they’ll give you 10% cashback on any losses, up to €50. Then return on Friday when we unveil Christmas Mission Five. Wager a minimum of €50 on any of selected games – Santa, Santa Spins, Book of Souls, Bonanza, Leprechaun Carol, Valkyrie and Jingle Spin – until 13th December 2018 and they’ll give you 10% cashback on any losses, up to €50. Minimum pay out for each cashback is €5. Players who qualify for the cashback will receive their reward in cash by 17:00 CET on 14th December 2018. 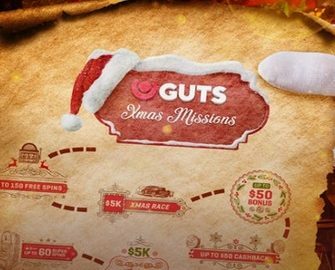 Only players who have deposited at Guts are eligible for this promotion. Guts Casino terms and conditions apply. Trada Casino – Boosted Cashback, all Weekend!